Our Indianapolis pool table movers have been providing expert pool table moving, installation, and repair services as a family owned business since 40 years ago. We know how much your pool table means to you, and we treat it as if it were our own. Our customers always come first. We service all types of pool tables, and our services and estimates are based on your unique specifications for the job. This client-centric approach allows us to offer an unbeatable quality service. We also offer a free listing section of pool tables for sale where you can browse or list your pool table for sale. We are the only organization in the industry that offers 7 days per week support for our customers with the most technologically advanced systems in use today, call our professionals to get a price to move your pool table or if you only have general questions. Your satisfaction is what has made us the largest and most professional company in the industry. We’ve been perfecting pool table installations for decades. Moving your pool table with the Indianapolis Pool Table Movers includes the proper teardown, safe transport and professional pool table setup with expert leveling, recovering with the existing material is possible if it is in good condition. Although, the best time to refelt with new cloth is when the pool table is in pieces. We provide pool table services and repairs also in Anderson, Brownsburg, Carmel, Connersville, Cicero, Crawfordsville, Cumberland, Edinburgh, Elwood, Fishers, Frankfort, Franklin, Greenfield, Greensburg, Irvington, Kokomo, Lawrence, Lebanon, Logansport, Martinsville, Maywood, Mooresville, Muncie, Plainfield, Shelbyville, Zionsville, and more around Indianapolis. Can you just move the pool table by yourself and save money? In almost every case the pool table needs to be taken apart professionally to be moved safely. Most billiard tables weigh in excess of 600 pounds and when people attempt to move them in one piece they can cause significant damage to the table. All billiard table installers go through a process of leveling with the proper tools, leveling equipment and experience in order to be played on to experience the best game possible. When you schedule your job with us we provide the professional pool table installers to properly move and install your pool table in hours. We have been servicing pool tables and taking care of professional pool table moves for years. Our crew of trained pool table movers has plenty of experience in all types of pool table moves. We handle each move from start to finish and we make sure your table is in the best playing condition it can be when we finish. When you schedule your job with us we provide the professional pool table installers to properly move and install your pool table in hours. We perfectly setup new and used pool tables all over Indianapolis and surrounding areas. We can also refelt your pool table as well with new material if you desire for an additional cost. Guaranteed satisfaction and leveling on applicable pool tables. Complete pool table moves from one house to another and we service local businesses also. We also offer a free resource if you need to sell a pool table in the local area. Skilled pool table movers for any type of pool table repair. Other services include in-home moves, proper breakdown, and safe transport to storage, professional pool table setup, pool table recovering of an already installed table and moves in two appointments for when you need your flooring replaced. Do you need to have a pool table repair taken care of? We can help too! Our crew of professional pool table movers will make sure you are taken care of either it is a residential or commercial service. We are well trained in our area of expertise. Why should you use experienced pool table installers? Traditionally in the country, pool table installers are a one or two man service with no customer support, client guarantees or even legal businesses. Please note that when moving a pool table we offer new cloth to refelt at the time of installation. When moving a pool table the felt has to be stripped off, in most cases it is in good enough condition to be reused. However, because this cloth has been on the table for quite some time in most cases, it may have to be replaced in the near future. Refelting a pool table when is already setup means the pool table will have to be disassembled to a certain extent, this will involve a partial installation and leveling job which is exactly why it is way more convenient for you to have the pool table refelting service at the time of assembly since the table is in pieces. Please consider this option if you notice the current felt on the table is quite old or if you’re looking to have a different color put on because of decorative purposes, let us know in advance and we will have the material ready in your desired color. Our customers can choose from over 30 different colors of pool table felt. We use the highest quality pool table cloth the industry has to offer at this time. This cloth is backed by our exclusive guarantee for a whole year after installation. Our professional pool table installers work with standard woolen pool table cloth and tournament grade worsted materials as well. If you’re not sure which size of table will fit best in your room, check out a chart we have put together with the proper pool table room sizes to verify the pool table that will properly fit in the room where you want it setup. The Indianapolis Pool Table Movers is backed by the only National organization in our industry. As Members of the ABIA, we are the only company in the area to offer you an exclusive 1-year service guarantee IN WRITING and issued by the American Billiard Installers Association. We are the only company backed by a formal national organization, with a written service guarantee that protects you to the fullest extent. We are devoted to covering you in every possible way, and our unique guarantee lasts for one year after the completion of our services. Find out more here. THE MANUFACTURER OR TYPE OF TABLE – Billiard tables come in 1 and 3 piece slates, 1 piece slates are found less often, also let us know if the table has a ball return system or if it’s a drop pocket billiards table. LOCATION OF ADDRESSES WE WILL TRAVEL TO – Location is a factor in everyone’s pricing model. 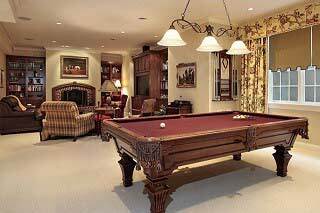 SIZE OF THE POOL TABLE – 7 foot, 8 foot or 9 foot, specifications can be found in our pool table room sizes page for each size pool table. Do you need to move or service your pool table? Indianapolis Pool Table Movers is the most reliable and professional company you will find! Call now for a free, risk-free estimate based on your circumstances.